Ashley Young is Raison’s organized creative. Whether it be project management, design, web, or anything else—she’s got the timeline and the vision. Ashley has been our go-to planner, solver, and (sometimes) office mom for nearly 6 years! Michael is Raison’s triple-threat—writer, web developer, and photographer—who tends to get himself involved in all types of projects. He’s a weird dude, father to a super cute baby, and a very consistent type of guy. Stephanie is Raison’s design diva. With a Master of Fine Arts in Design from VCU, she’s our in-house expert on motion design and beyond. Lee is the leader of team Raison. He works with big league organizations while getting small startups off the ground. If there’s one thing his clients have in common, it’s this: there’s something to learn from everyone. With experience in the world of tech and urban planning, Aaron is the man with a plan. He strives to keep his cool in all situations, which might explain the origin of his nickname. When it comes to online marketing, your network is truly your net worth. The healthcare startup can pose some serious challenges to the venture capitalist. 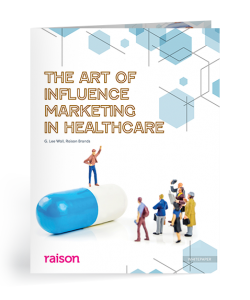 For a young healthcare business, influence marketing should be at the top of your marketing plan. If you thought 2016 was a big year for healthcare, wait until you see 2017. For Louder Than Digital, style speaks volumes about quality of service.